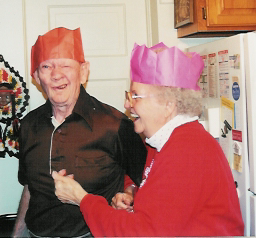 Grandpa and Grandma goofin’ in their Christmas cracker hats. In honor of Father’s Day I’d like to dedicate this post to Grandpa. He was the yin to Grandma’s yang, the cream in her coffee and the sugar in her tea. They never argued; if she got cranky he’d say “you’re always right dear, except when you’re wrong.” He was humble, hard working, and he chased me around with his dentures hanging out when I was little. It scared the crap out of me, but I begged him to do it every time I came to stay. I know I’ll never meet another soul with a heart as good as his. Thank you for everything you taught me, Grandpa. I miss you. Grandpa built cabinets, installed water heaters, laid flooring, knocked out walls and built breezeways. He could build or fix anything, and he never took a cent when he did something for someone else. Grandma always joked the widows in town kept a close eye on him. Grandma and Grandma always had cats. And your clothes were always furry when you left their house. Thank goodness Grandma still has Fluffy. When I go downstairs and find Grandma asleep in her chair, I know she’s still warm if the cat’s in her lap. Grandpa didn’t so much cheat at dominos, he just changed the rules as the game went on to give himself the advantage. The fact I always called him on it was part of the fun. If a friend was unloading a refrigerator, Grandpa lent a hand. If the church needed a new roof, he helped. I never heard him say no. And we never went anywhere without him running into a friend. The picture I posted is vintage Grandpa. I think it speaks for itself. Every year they put me on the back row with the boys in school pictures because I was tall, and every year I pouted when Grandpa asked me how many of them I kissed. Years later I realized how much fun he had when I teased Michaela about going to school at Hocker Grove — Home of the Loogies. It got a rise out of her every time. Grandpa introduced me to bananas with peanut butter, sardines, and corn chips with bean dip. I don’t eat sardines any more, but sometimes I eat the other two just because they remind me of him. Grandpa loved the annual gem and mineral show. And when he and Grandma went they always took me. When I got my own rock tumbler for Christmas one year, I used it on every rock I could find. Grandpa and I always compared favorites. When Grandpa opened a gift, he carefully pried off every piece of tape one by one. Sometimes he stopped halfway through and pretended to do something else. It drove my daughters crazy. And at Christmas we still joke about how long it took him to open presents. Grandpa was active and healthy til the last year or so of his life. When he was diagnosed with congestive heart failure, he eschewed prescription drug side effects in favor of more holistic treatments like vitamins and acupuncture. He spent his last few weeks in hospice, where the only request I ever heard him make was to go outside. When Grandma dies I’m going to spread their ashes together somewhere — maybe near the Flint Hills with my Mom’s. I think he’d smile knowing a piece of him would be with them both forever. I know I do. Reading your post brought back so many memories! My grandparents are both gone now, but the fun and touching memories and stories remain. Thank you. I thought about posting tomorrow, but if people read this today they might make the extra effort to see their dad or grandpa on Father’s Day. You don’t know how much you’ll miss them ’til they’re gone. Thanks Pat. I thought about reading it to Grandma but I know she’d cry. I’m glad to hear that your grandpa passed away with dignity. Many families have a hard time accepting hospice care and I hope that more and more people understand the purpose of hospice care. Hear, hear! The hospice volunteers are heroes in my opinion. They treated my Grandpa kindly and seemed to sincerely care about him. It made me feel better when I left after visits knowing he was in good hands.